The Smart Drill, trademarked and patent protected by LiveVue technologies enables dentists to have greater control, precision and accuracy in drilling a patients gums in the process of fitting dental implants. This cuts down on the time taken and above all, makes the process much safer for the patient. The smart drill allows better alignment and a much better system of tracking the depth when drilling holes, a pivotal part in the overall implant process. 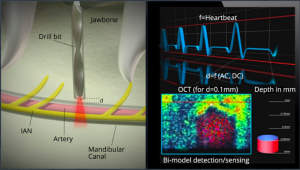 A live feed of the patients heartbeat, as well as a clever depth tracking system allows dentists to have complete control of the process, like they never have before.